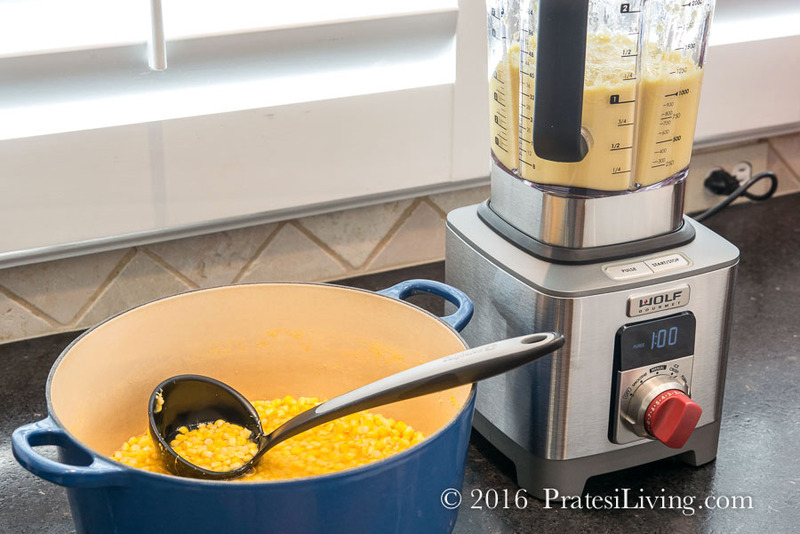 What could be better than a dish made with fresh, sweet summer corn? In early August corn is at its peak in many parts of the country. 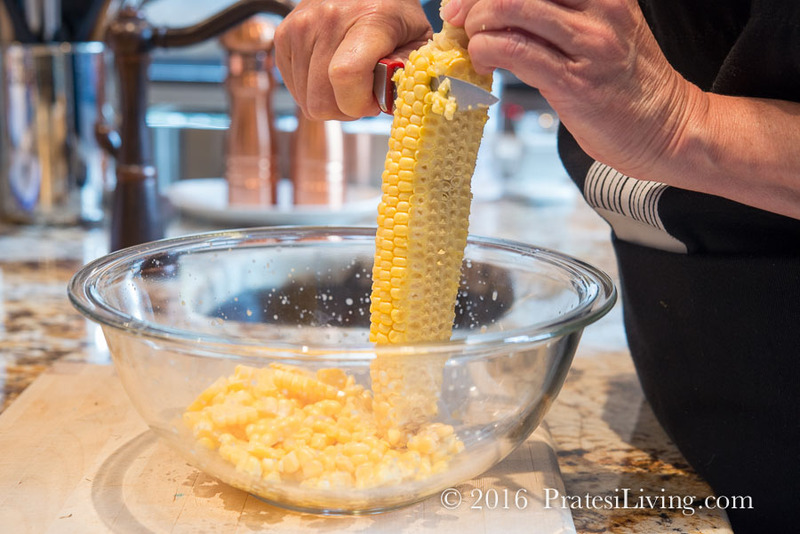 When it’s in season, if you love corn as much as we do, you should eat (and cook with it) as much as possible, because come fall, it will all be gone and the only thing frozen corn is passable for is maybe…Grandma’s corn pudding recipe at Thanksgiving dinner. We loved having access to just-picked Silver Queen corn in North Georgia and Western North Carolina when we had our home in the mountains. Unfortunately, nothing we’ve found in Atlanta compares to what we were able to source there, even at local farmers’ markets. 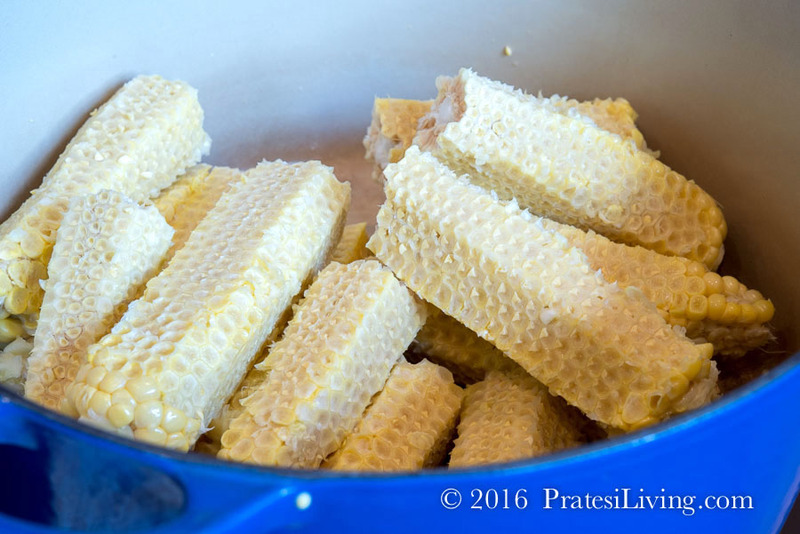 It was so sweet and so good that you could literally eat it raw on the cob with no steaming or grilling – forget slathering the cob in butter and sprinkling it with lots of sea salt and freshly ground black pepper. When it’s that fresh, the corn is so sweet, it’s perfect on its own. 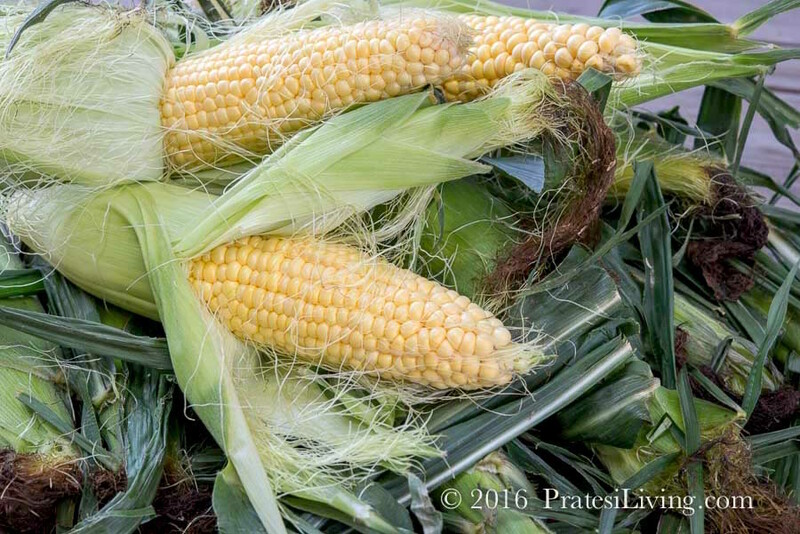 This year, we’ve yet to see any Silver Queen corn, our favorite, but we have purchased bicolor and yellow corn if it’s fresh, as evidenced by the color of the silks and husk. If it’s possible to check, you can also tell the freshness by piercing a kernel to see how much “milk” it produces. Once it’s no longer fresh, corn looses its sweetness and becomes very starchy. When I was looking for recipes to create and make with the Wolf Gourmet Blender for a review and giveaway (head over to the link to enter! ), I immediately thought of preparing a seasonal soup made with corn. Many soup recipes featuring corn, purée the corn and broth it’s cooked in and then add in cooked corn before serving to give the soup texture. 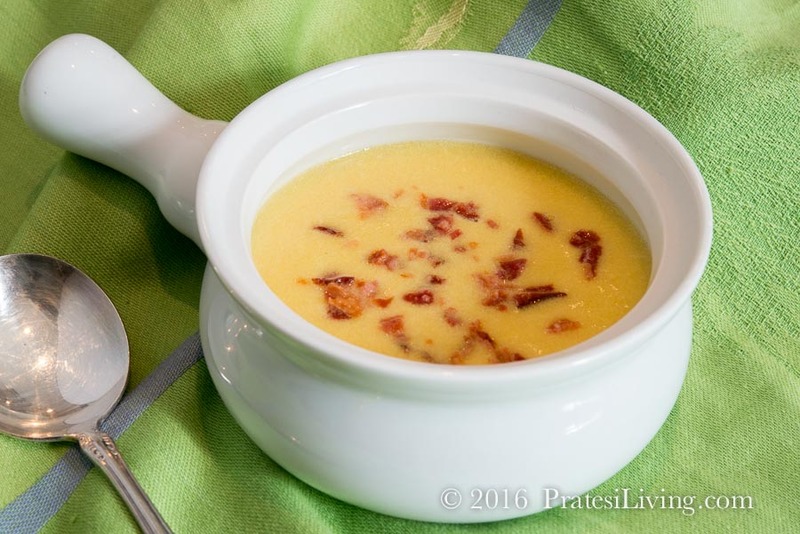 We have a wonderful and hearty corn chowder in our book that is made with country ham, Benton’s bacon, cream, and a lot of other ingredients, so the flavor comes from the mirepoix, rendered fat, and added seasonings. However, I was looking for something simple and quick to prepare as it’s summer and no one wants to stand over a hot stove for long hours making soup. I came across this recipe from Gourmet Magazine, which is literally made with corn, water, and salt. That’s it. With the short list of ingredients, it’s all about using the best corn available in season. 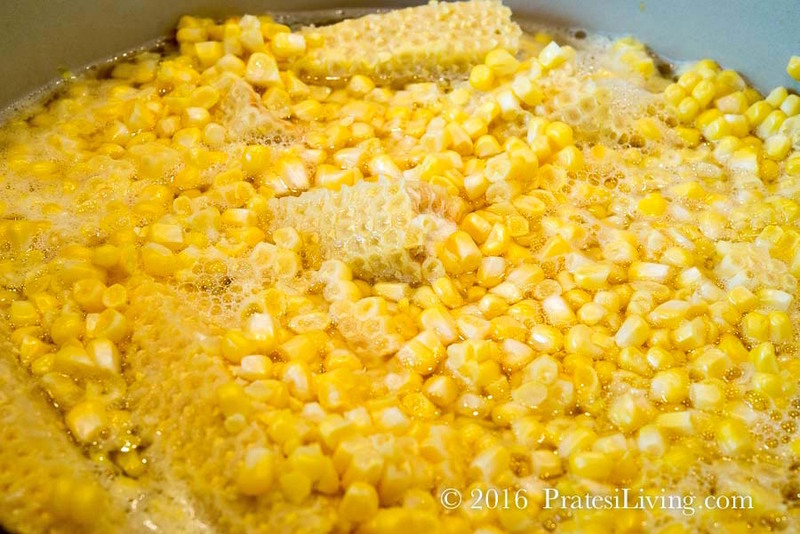 We even added the cobs back in the pot to cook with the corn and water to extract as much corn flavor as possible. That was not part of the recipe from Gourmet, but it definitely enhances the flavor. The original recipe strains the soup through a sieve and takes out all the puréed kernels, pressing on the solids, which we didn’t care for; it was like corn water and the mixture separated. Not pretty. Some people left comments online saying they added milk to give it substance. That didn’t work for us either. Instead, I pureed the entire mixture, sans corn cobs, until it still had substance (and you knew it was a corn soup), but the mixture was almost completely smooth. A high performance blender does this task best and will give the soup a wonderful texture you can’t achieve with a regular blender. Finally, I served the soup with the suggested chopped chives and then again with cooked and chopped bacon. After all, as we know, everything is better with bacon. 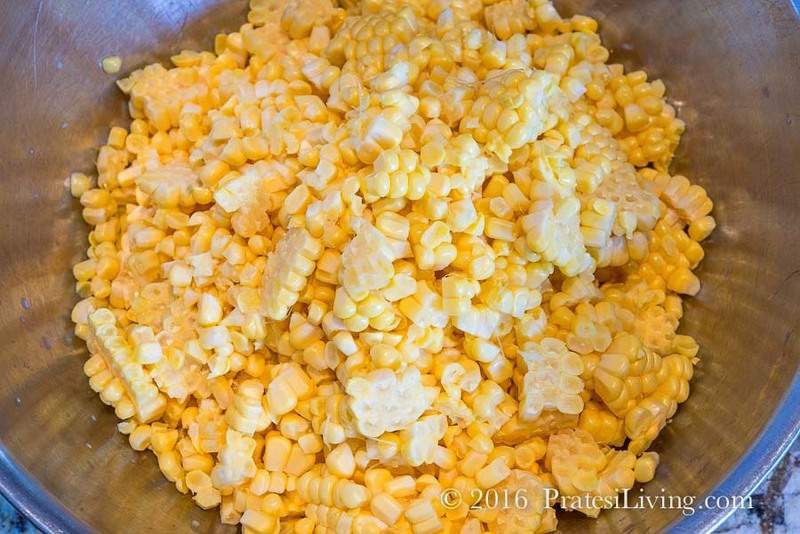 Simple to prepare, we liken this to a bowl of fresh creamed corn, which can only be made a few times a year; when corn is at its best and incredibly fresh and sweet. 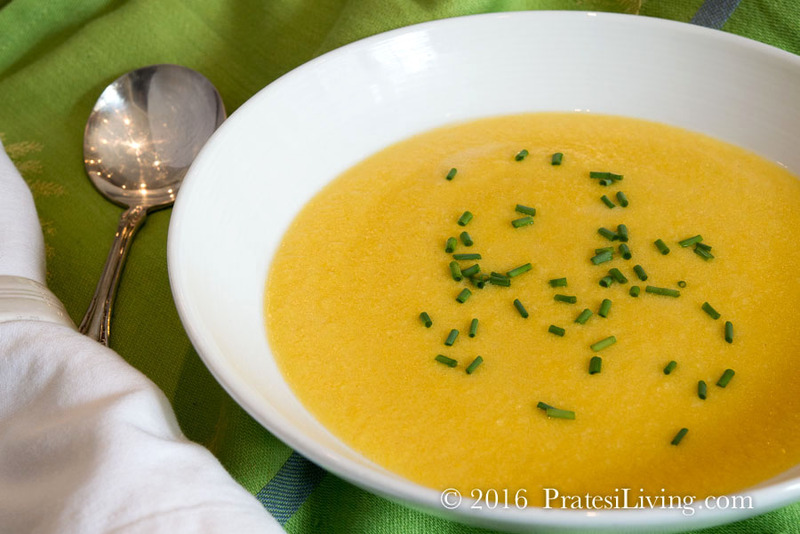 If you’re looking for a soup to make for a summer evening’s family supper or a first course to serve when having guests, this is quick and easy to make and can be elevated for a dinner party. Fresh crabmeat and a drizzle of chili oil would be a particularly elegant way to serve the soup for a dinner party. As we usher in early fall with the start of a new school year, take time to enjoy the last of summer’s harvest. It will soon be apple, squash, and pumpkin time and we’ll all be wondering what happened to summer. If you would like to enter to win a Wolf Gourmet Blender, head over to this article to enter the giveaway. It ends August 10, 2016, so hurry! This recipe is incredibly easy to prepare and delicious. Use only the freshest corn available and in season for the best results. While you can serve it with the garnishes suggested below, for a special occasion, serve the soup as a fresh course dressed with lump crabmeat and a drizzle of chili oil, for an elegant dinner party. In a large Dutch oven, add the corn, reserved cobs, water, and salt. Bring to a boil, skimming foam as necessary. Lower heat and cover and cook for 20 minutes. Remove cobs and discard. Purée soup in batches until smooth, preferably in a high performance blender, filling only about 1/3 to 1/2 of the way (use caution when working with hot liquids in a blender). Place puréed soup in a large clean pot and reheat or hold over low heat until ready to serve. If soup becomes too thick, thin with a little water. Adjust seasonings before serving and top individual bowls with desired garnishes.